In the first installment we found Jaz, Chaylea, and Gabby escaping to a secluded cabin for a writing retreat over the Christmas holiday. A chance to spend time with some close friends and write, changes the instant that the wolves appear. Installment 1.1 found Jaz acting out of character and thinking she was dreaming a happy holiday with an alpha hero from one of her books. In the second installment we see events from Ridge’s point of view as he steps back into the events of the previous day. Ridge struggles with the fact that Jaz is his mate and after their night of passion he is now tied to her for the remainder of his life — unfortunately Jaz thought it all a dream and knows nothing of what Ridge really is… a wolf shifter. Adding in the rogues him and his men were tracking when they found the women and a shocking revelation, Ridge has had enough for one day and all he wants is his mate. 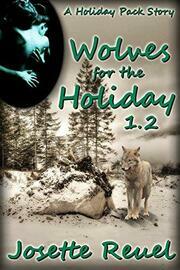 Will Ridge survive the holiday morning from hell? Will Jaz leave him standing in the cold?